Articles Why You Should Microchip Your Cat! Why You Should Microchip Your Cat! A study in the Journal of the American Veterinary Medical Association, reveals that fewer than 2 percent of lost cats and about 22 percent of lost dogs entering animal shelters are returned to their original families. When microchipped and registered, 52 percent of dogs and over 38 percent of cats are re-united with their owners. Unfortunately, only 58 percent of microchipped animals have been registered in a database with the owner's contact information. No matter how closely watched, there is always a risk that your favorite animal friend can get out and become lost. The possibility of a door or gate left open, a natural disaster, or an emergency beyond the owner's control is always possible. When a natural disaster occurs, shelters from all over the nation respond. Pets can end up hundreds of miles away from their homes making it almost impossible for a un-mircochipped dog or cat to be returned home. Pets can be stolen - particularly exotics or purebred animals. Shelters want lost pets to make it home to you. However, shelters are also trying to find adoptive homes for all those that come into their care. If your lost pet does not have any identification it is clear the likelihood that you will see him again is small. Pet collars and identification tags detach easily, especially with cats. Also, pet owners often forget to update the identification tags after moving. However, implanting a microchip is a permanent identification solution. Almost all shelters, veterinary clinics, and rescue groups routinely scan for microchips when a lost animal is brought to them. A microchip is smaller than a grain of rice, inserted just under the skin between the pet's shoulder blades. The microchip is inert, harmless, and will stay safely in place offering identification protection for life. Each microchip has a unique identification number and does not require a battery. However, microchips are not GPS devices or radio beacons that allow a pet to be located remotely. It is important that owners register the microchip and their identification information with the correct registry. When your pet is "chipped" you will be given all the needed documentation for registration by the person implanting the microchip. 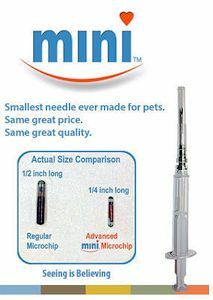 There is a fee for registering the microchip. Some registries charge a one-time fee and others charge yearly. Most registries have a 24-hour, 7-day a week support so a veterinarian or shelter can contact them any time. The American Animal Hospital Association (AAHA) Pet Microchip Lookup database provides a lookup tool for any microchip, regardless of the registry. Some microchip registries allow an owner to add information about their pet including a picture of the pet, owner contact information including email addresses, secondary emergency contact information. It is important for owner's to keep their contact information up-to-date, especially if there is a change in address, phone number or email address. A microchip is the best way to prove the identity of a pet...and to get him home fast if lost. Over 20 million pets are lost every year. Microchip protection almost guarantees the pet will not be euthanized or put up for adoption if he is taken to a shelter.